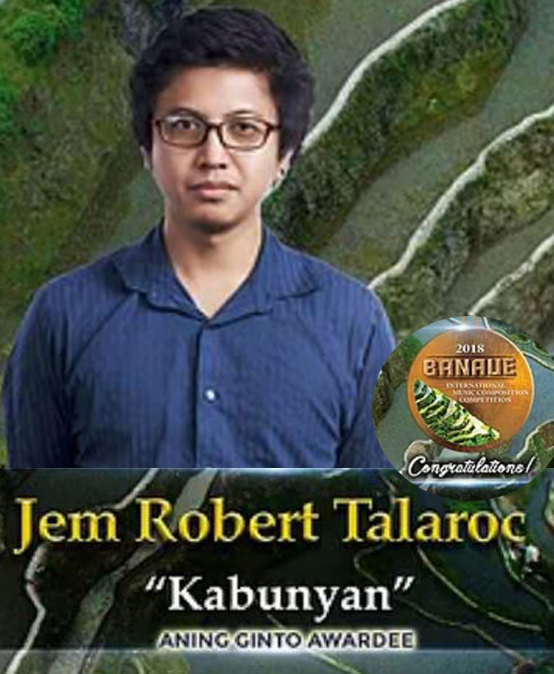 Jem Robert Bautista Talaroc, a graduate of the College of Performing and Visual Arts (COPVA) in 2008, is the only Filipino who bagged an award in the Banaue International Music Composition Competition (BIMCC) held at the Cultural Center of the Philippines (CCP) on July 26. 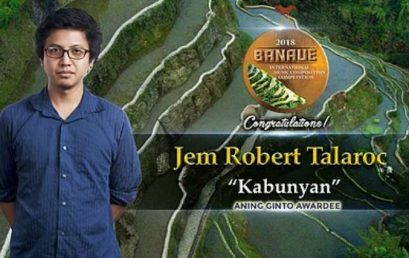 Talaroc was given the Aning Ginto award for his composition, “Kabunyan,” named after Kabunyan the highest among all the Ifugao gods and Kabunyan the Skyworld, the place where, according to Ifugao myth, all gods live. Talaroc finished as one of the top three winners in the competition, along with fellow Aning Ginto awardee Alessandra Salvati (Italy) and Grand Prize winner Leon First (Slovenia). The competition was organized and funded by Universal Harvesters, Inc. as part of the Banaue Rice Terraces Restoration Project which aims to create Banaue-inspired symphonic works and use it to promote awareness of the current situation of the rice terraces.